Online Sign Supply Company Sells Sign Supplies at Wholesale! These Sign Supplies Meet the Needs of Every Business! 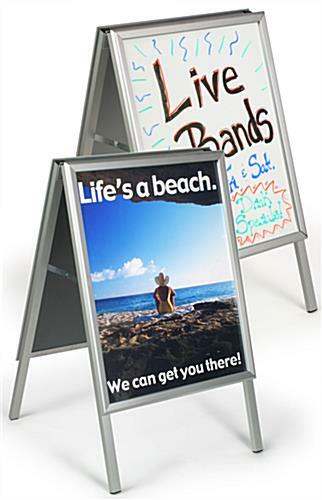 Sandwich board sign exhibits, like these sign supplies, are constructed of anodized metal so they are easy to carry. Our moveable write-on sign supplies fold up so they are effortlessly transported and stored. Our company sells these moveable sign supplies with a climate tolerant acrylic lens. This lens is non-glare so your visual graphic is easily observed in daylight or under a streetlight. These sign supplies are for outdoor use, nevertheless, it is recommended that you bring your pavement sign in during wet weather conditions. This is because our pavement sign is designed for wet erase marker pens only, which will come off in the rain. Please Note: Merchandise is not intended for use during stormy weather, as well as harsh winds, rainstorms, or snowstorms. These inexpensive sign supplies for sale here are ideal for every business as both an indoor and outdoor exhibit. 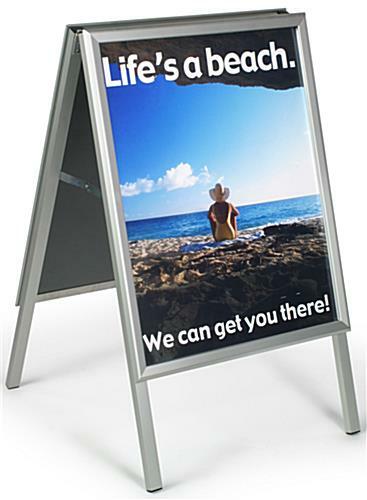 Sidewalk signs, likewise known as sandwich boards, are a special means to exhibit your advertising messages. 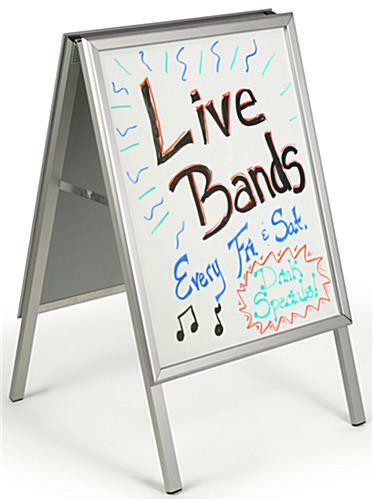 These sign supplies are usually utilized as both a write-on boards and poster sign holders. 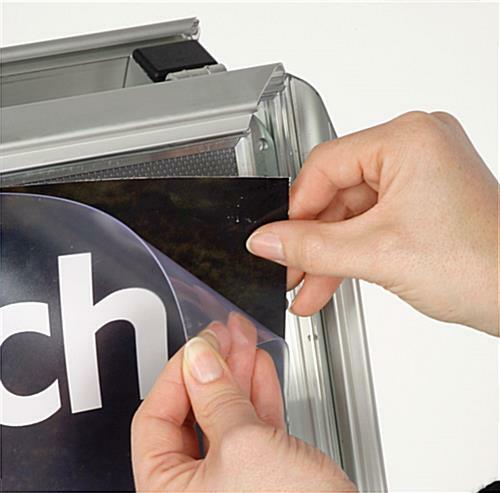 Our company sells these double-sided sign supplies with a Lucite, write-on insert so you that can produce an effective message that you are able to modify as often as you like. 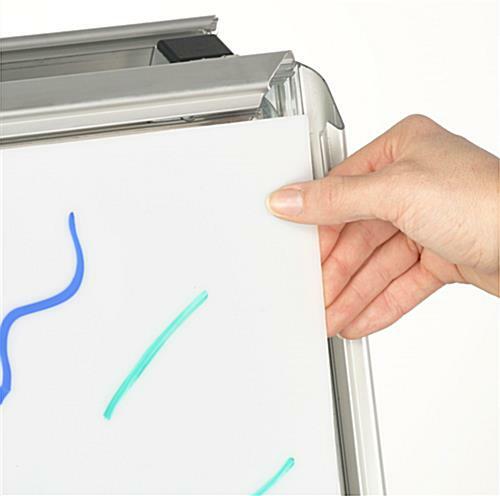 Your communications are easily removed by merely snapping open the encase sides and detaching the Lucite panel. The clip display covers ½" of these sign on every side. Buy wholesale sign supplies now! These freestanding sign supplies hold two 22" x 28" size posters, one on either side. 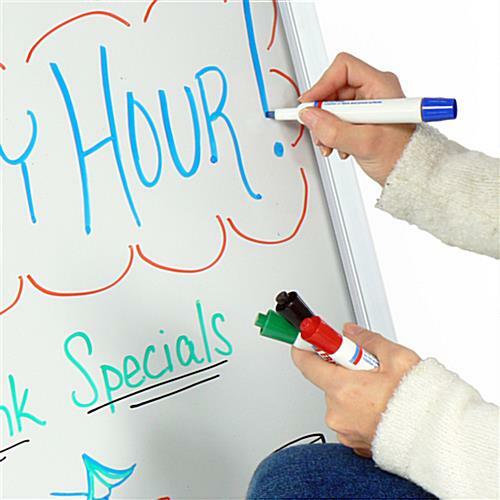 Sandwich boards, sidewalk displays, and other sign supplies, are ideal for advertising a sale or daily special outside your store or restaurant.